This stylish humidifier helps you control moisture in the air while adding a sleek touch to any room. Sleep soundly through the night without having to refill the large tank. It has the capacity to run nonstop for a full day! It will also shut itself off when the water gets too low and the light will turn to red. Control both the amount of mist and the direction. Plus, it's whisper quiet so it won't disturb your busy lifestyle, your sleep, or your work. The filter free feature means that you don't have to stop in the middle of your day and replace costly filters. Sleek and Stylish. 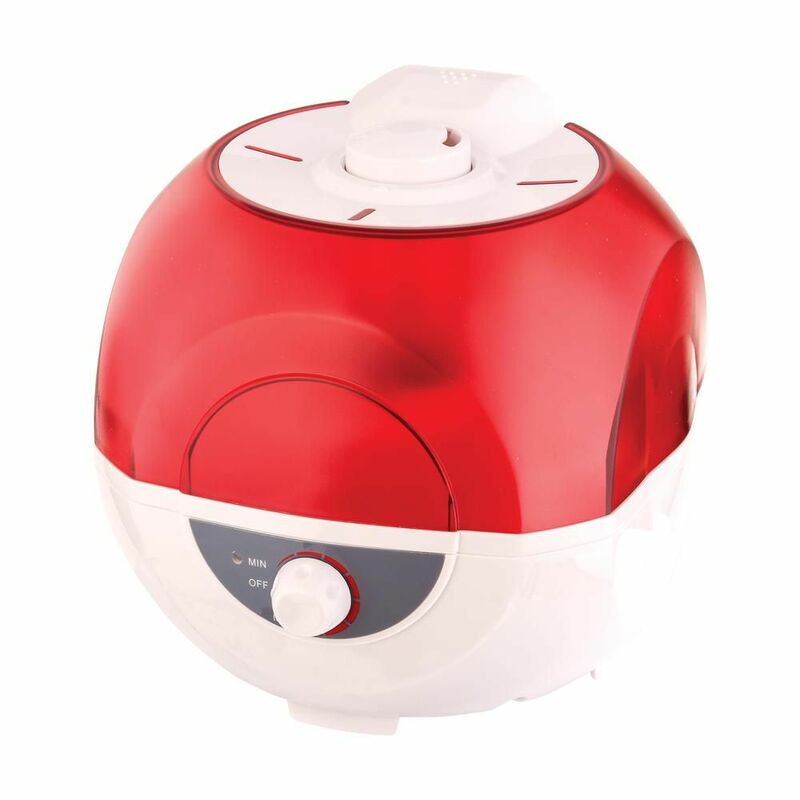 This vibrant red and white humidifier will add a sophisticated touch to any décor. You won't have to constantly interrupt your day or night to refill it because it runs up to 24 hours! PureGuardian H965AR 70-Hr Ultrasonic Humidifier with Aromatherapy Tray guards against problems caused by dry air in the home. Make life pleasant for those with cold, flu and dust allergies. Treated with Silver Clean to fight the growth of slimy mold and mildew on the surface of the water tank a common problem with traditional humidifiers. Aromatherapy Diffuser by Guardian Technologies. Bring the luxury of a spa visit home! The PureGuardian SpaUltrasonic Aromatherapy Diffuser delivers a fine, ultra-quick mist and fragrant vapor with the addition of your favorite essential oil. Enjoy simple touch controls and automatic shut-off when empty. Small, lightweight, and portable, its perfect for the bedroom, office, dorm and hotel rooms. Guards against problems cause by dry air in the home. Comes with aromatherapy tray for your favourite essential oils. Makes life pleasant for those with cold, flu, allergies and dry skin. Treated with Silver Clean to fight the growth of slimy mold and mildew on the surface of the water tank a common problem with traditional humidifiers. Ultra-quiet: perfect for all including sleeping children. Ultra-quick: immediately begins to disperse a fine, even mist creating a comfortable environment. Ultra-easy: eliminates evaporating filters that must be cleaned or replaced and breed mold and mildew. Bubble Mist Cool Mist Ultrasonic Humidifier This stylish humidifier helps you control moisture in the air while adding a sleek touch to any room. Sleep soundly through the night without having to refill the large tank. It has the capacity to run nonstop for a full day! It will also shut itself off when the water gets too low and the light will turn to red. Control both the amount of mist and the direction. Plus, it's whisper quiet so it won't disturb your busy lifestyle, your sleep, or your work. The filter free feature means that you don't have to stop in the middle of your day and replace costly filters. Bubble Mist Cool Mist Ultrasonic Humidifier is rated 5.0 out of 5 by 1.